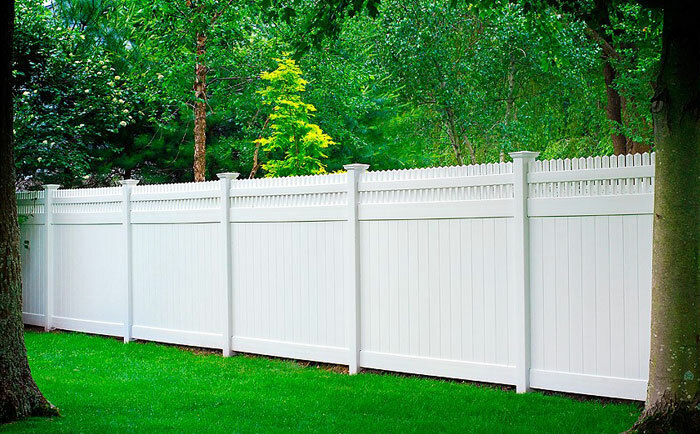 This page is our vinyl fence planning guide to help you better understand how to plan your fence project and to help ensure that no details get overlooked. 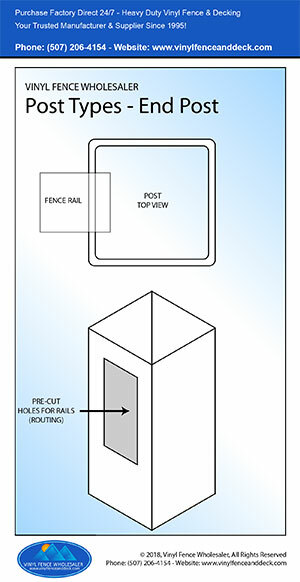 We have put together a list of vinyl fence plans plus visual guides which will help you determine what’s needed to complete your project and to provide ideas and options for unique situations. Simply click on the PDF visuals and Images below to enlarge and print. 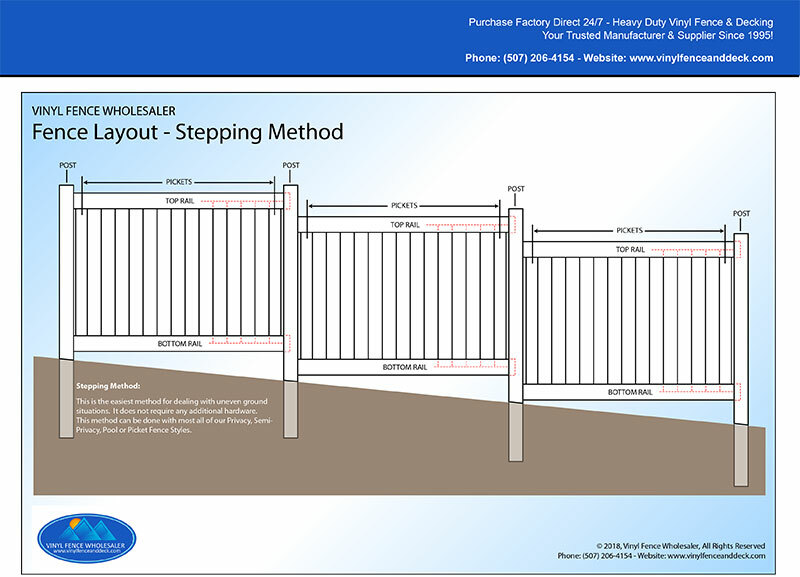 The above illustration shows the different fence components and their names, that make up our complete fence systems. Click on the image to print our to enlarge. 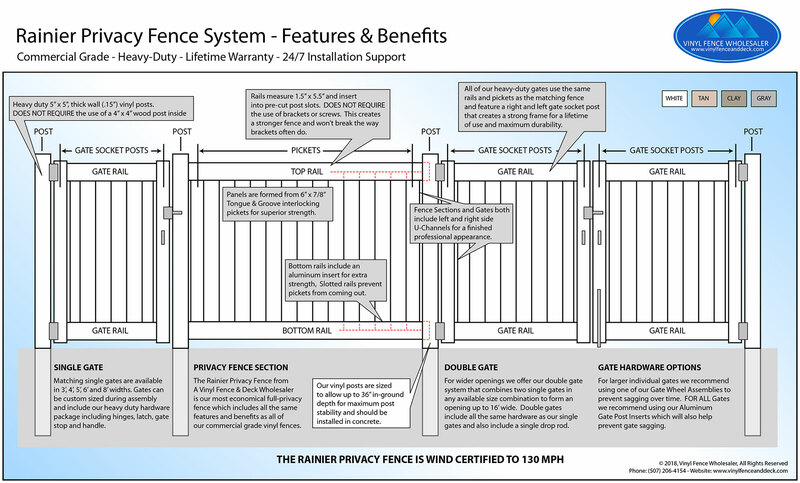 The fence shown in the image is our Rainier Privacy Fence, keep in mind most terms are universal and apply to all fence styles we offer. 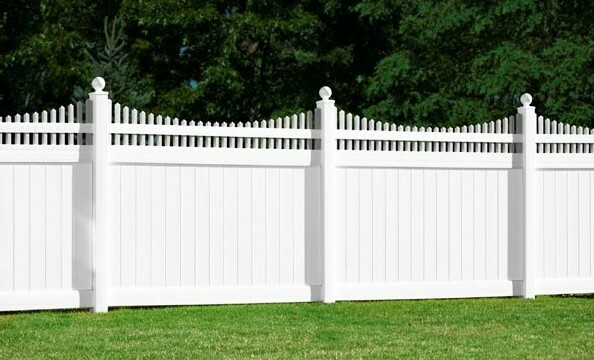 For detailed information and specifications for each fence style we offer, please click our product menu above to visit our fence product pages, our view our Vinyl Fence Product Guide for a complete listing of fence styles, sizes and options. Used where two sections of fence meet and are running in a straight line. For angle variation please read info above. 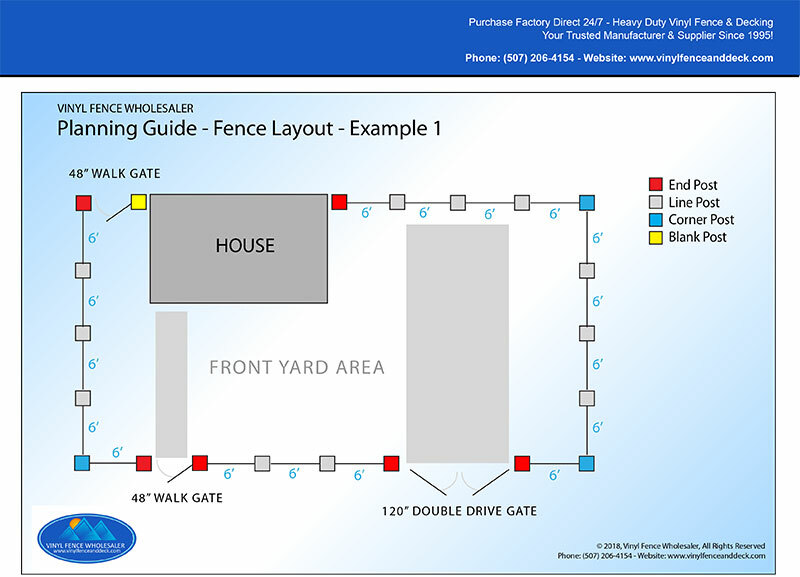 Used where a fence line starts and ends including when a gate will be installed on any remaining side. Used where a 90 degree corner is desired. For custom angle variation please read info above. Used when no fence is to be attached as would be the case for a gate at the end of a fence line. Layout Plan Samples- Click Visuals to Print or Enlarge. 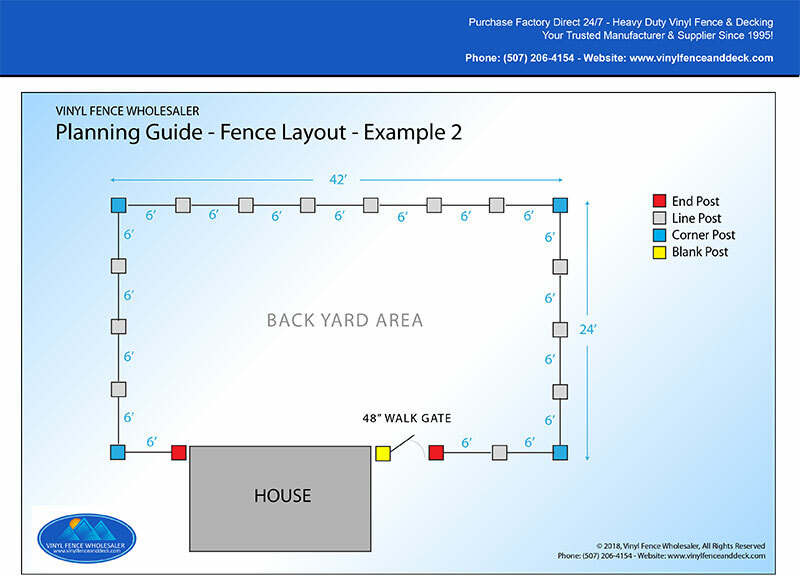 The visuals below are examples that demonstrate two common fence layout configurations. Keep in mind, you can create almost any angle with our fence, as we know not all fence layouts will be a perfect rectangle. Read above section under “Post Types and Their Uses” for further information. 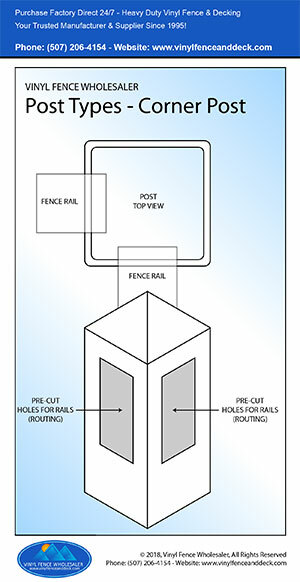 Our detailed visuals below should help you better understand how our different types of posts are used, and the number of posts required for your fence project. 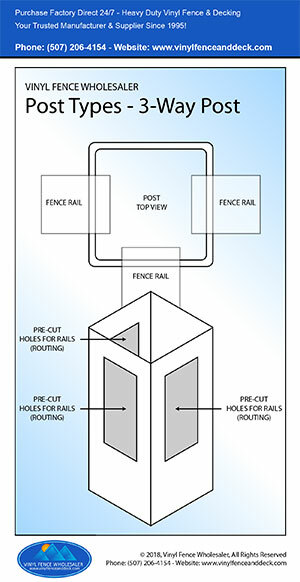 Adding gates, stopping and starting a segment of fence, splitting a section of fence in half, these are common situations that require additional posts beyond the “one post per section” normally included with our fence panels. In this example of a residential home front yard you can see the posts used at multiple gate locations/placements. Each situation is different and different post types are needed to accommodate. In the second example, this one showing a back yard, we show a very standard configuration. You can see that in both examples the gate next to the house uses a Blank Post and not an End Post. 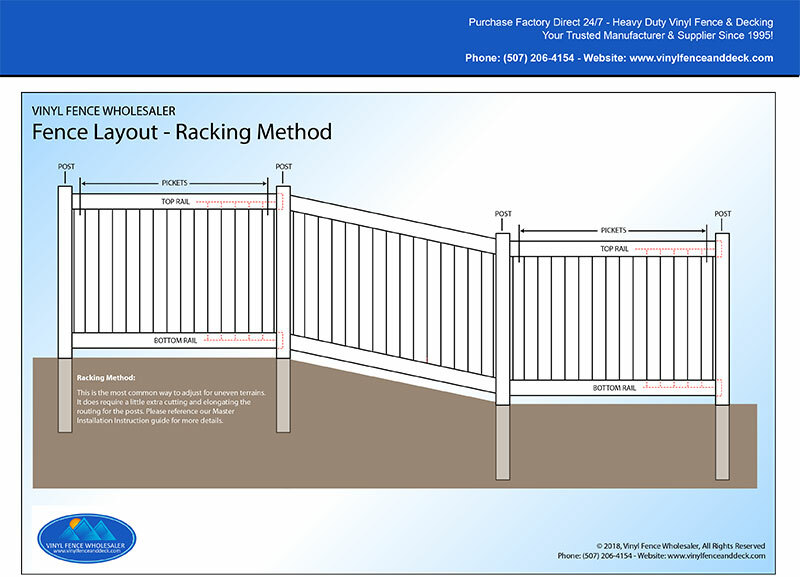 The two most common options for installing Vinyl Fence on a surface with an elevation change or grade variances, is referred to as Racking Your Fence, or Stepping Your fence, as shown below. Racking allows you to follow the elevation changes of your land. This is accomplished by elongating the routing on our posts. This can easily be accomplished during the installation process by using a sawzall, hand saw or jig saw. Depending on the severity of the rack, you may need to cut the pickets at an angle as well or possibly order larger pickets to accomplish the rack. Make sure to let us know if you have a severe slope so that we can help make sure your order is correct. For specific questions or assistance please [Contact Us] and speak to one of our trained fence and installation professionals. 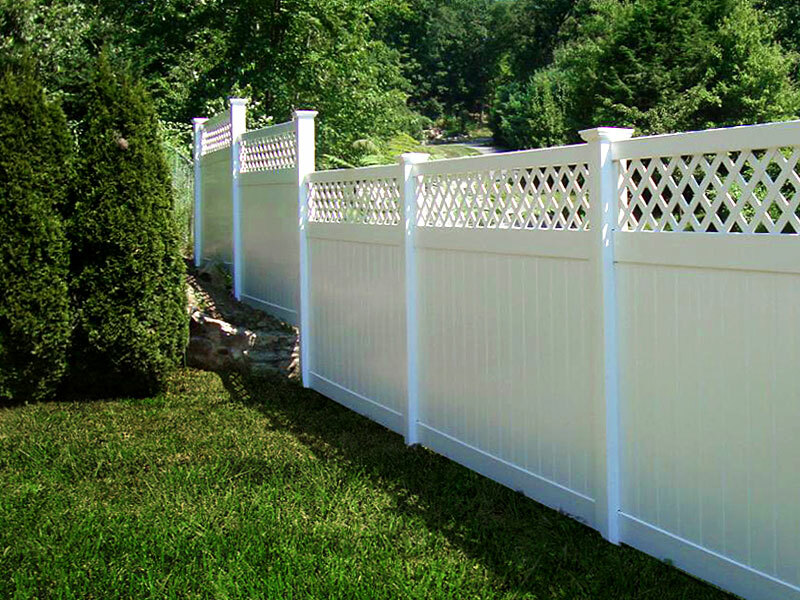 We can help you plan your vinyl fence project to help ensure that you have everything you will need to complete your fence project. 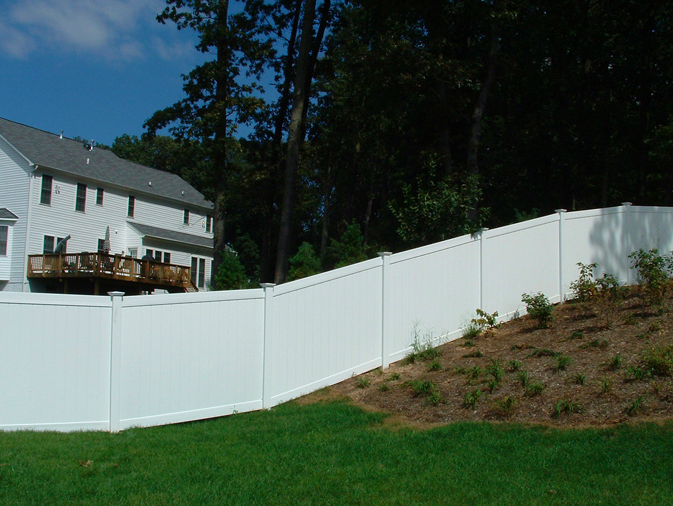 An example of a Racked installation using our Rainier Privacy Fence. 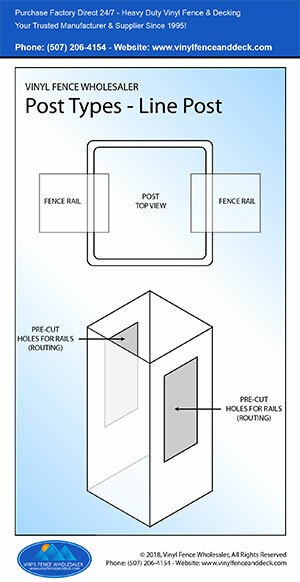 This technique can be used with almost any of our Fence Styles. Stepping a fence is similar to stair steps. By stepping a fence up or down a slope you are creating a stair case effect with your fence panels. In order to accomplish this we will need to know in advance so that we can provide end posts for each panel. 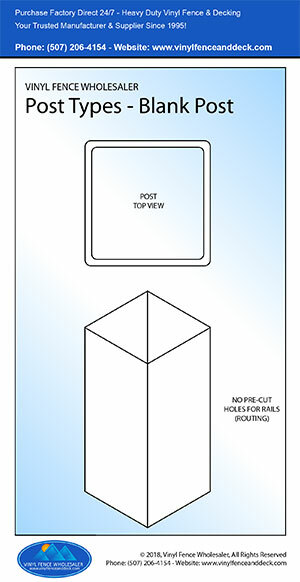 You will need to simply cut the holes on the opposite side of the post to allow for the elevation change. This is easy to accomplish with a sawzall or jig saw. As each step may be different, this has to be done during the installation process and it is very important to let us know this prior to ordering so that we can make sure to provide the correct posts for your project. In some cases you may need to use longer posts which we can eaSily accomodate. For specific questions or assistance please [Contact Us] and speak to one of our trained fence and installation professionals. An example of a stepped installation using our Rainier Privacy Fence. The same result can also be achieved with any of our fence styles. You can mix styles and colors to create a unique look for your yard of fence project. Standard Colors to choose from include White Tan, Clay and Gray, can be combined in a variety of ways to create a custom look. A Color combo example is white posts, white horizontal rails, tan, clay or gray interior. 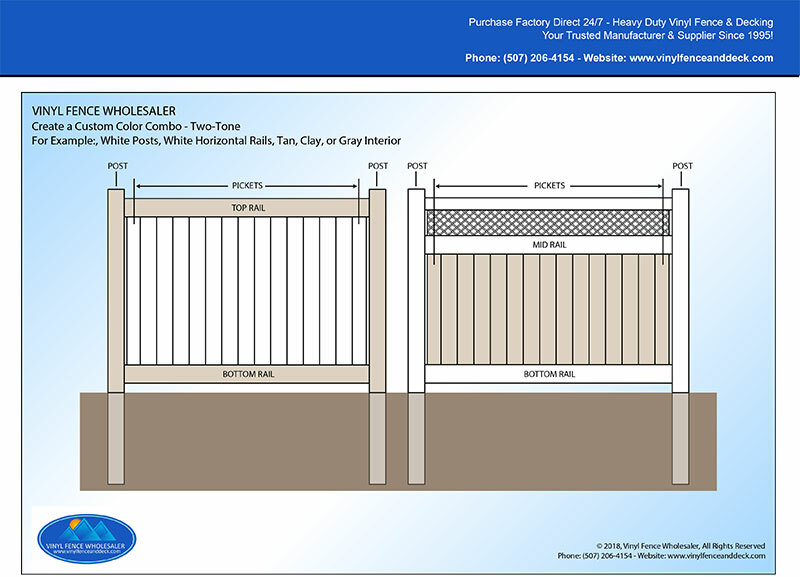 Most all of our fence style come in our these standard colors; White, Tan and Clay. 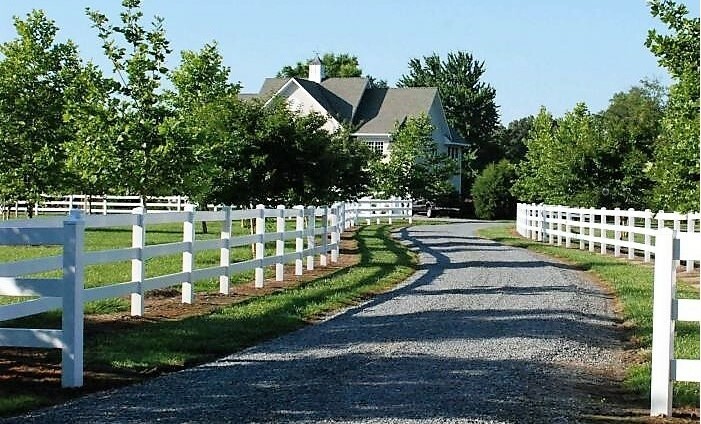 The Rainier Privacy and our Ranch Rail Fence is also available in our light Gray. To view our complete list of color options click here [ Available Colors ].